A single element control system is one with just one control input, a two element control system is one with two control inputs, etc. A three-element boiler water level control system is one which typically uses the measured water level, the steam flowrate from the boiler, and the water flowrate into the boiler to regulate the flow of water into the boiler. Although you might think that measuring water level alone is sufficient, you have to bear in mind that the boiler water contains lots of steam bubbles. Bubble size is affected by pressure, so if a boiler experiences a sudden extra demand for steam, its pressure drops. The drop in pressure causes the steam bubbles in the boiler water to expand, and the level measurement can show an increase in level. The false high reading makes the water level control system reduce the flow of water into the boiler. Once boiler pressure is restored the steam bubbles contract, and the measured water level drops suddenly. The level control system responds to this by increasing the flow of water into the boiler, which effectively deluges the boiler with relatively cold water, and boiling is arrested. Some of the steam bubbles in the boiler water collapse, and the boiler water level drops significantly – possibly to a low-level alarm or lockout. By adding water and steam flow measurement into the control system, we can identify any major disparity between the two, and make a compensation to the measured water level. This means that any transient peak demands on the boiler are recognized as such, and the feedforward control is appropriately applied. Incidentally, it is possible to achieve the same results using a two-element control system (level and steam flow), but it is easier to commission three-element systems. 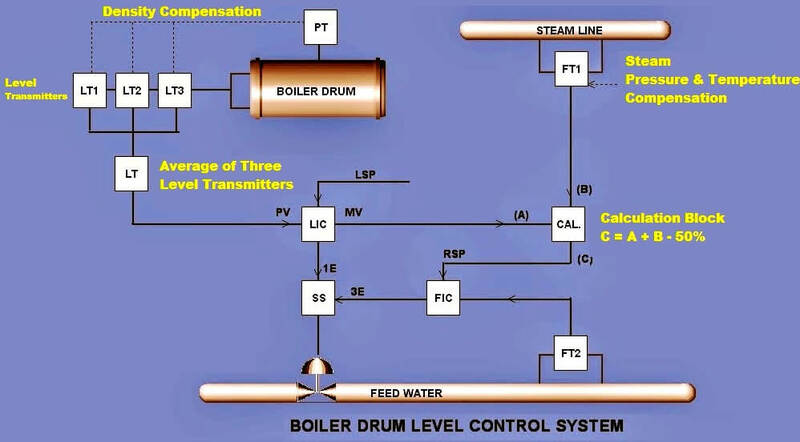 Three-element boiler water level control systems are sometimes refereed to as “feed forward” control. This is because the system identifies a transient high demand for steam before it has any effect on the boiler water level, and therefore starts to put extra water into the boiler in anticipation of demand. In this control philosophy, there are three process variables. 3. Steam Flow to control boiler Drum Level. Here, LT1, LT2 and LT3 are three different Level transmitter. reason for using three level transmitters is simple that, in case of failure of any transmitter(s), control wont be affected. LT is average of three LTs. Water density changes with pressure. So density compensation is there for every level transmitter. LIC is first PID block with LT as process variable. FT1 is the steam flow leaving the steam drum. Here we have done pressure and temperature correction. Output of LIC and FT1 goes to one calculation block. Output of this block is our remote set point for Flow controller (FIC). FT2 is feed water flow to the boiler drum and process variable for FIC. SS is selector switch. By this controlling philosophy can be selected either single or three element. FCV is feed flow control valve. The steam flow signal sensed by the steam flow transmitter FT1 acts as a feed forward signal and takes care of the shrink & swell effect. The steam flow transmitter is connected across flow nozzle, and the signal is then compensated for pressure and temperature. LIC is the primary controller in the three element level control function. When the steam drum water level is below the set point, controller LIC will further increase the remote set point of the feed water flow controller to increase the feed water flow. When the level is too high the reverse action will take place. The Level controller LIC output signal is added with the compensated steam flow signal at calculation block. FIC is the secondary controller in the three element level control. When the feed water flow is below the set point, controller FIC will further increase the feed water flow by opening the feed water control valve. When the flow is too high the reverse action will take place. Very simple and easily understandable description. Thanking you for your support & motivation. Very nice explanation about all topics. So please give me density compensation Formula for drum level with example. Nice & simple explaination. Its easy to understand the priciple of 3-element loop. Thank you for your post, but could you please explain to me what the figure 50% means? hello guys, I’m facing a trouble with 4 marshaling cabinets: Earth leakage fault appeared at the beginning of power-up on displays of VIGIBLOC inside cabinets . This is durga prasad regala,control & instrumentation . in our plant we are using DP level transmitter for one tank,this tank is closed tank and under vacuum ,so we are facing problem with this level measurement ,can give solution for this tank,how to over come from this issue . It is recommended to use GWR (Guided wave radar) type level transmitters for such applications. Very good response & reliable! Well…..there will be a natural level difference between the right and the left side of the drum. So anyway you need minimum two transmitters ;one each mounted on each side and it can be averaged or one transmitter can be considered in case of other transmitter failure using selector switch on xmr failure. However, since we need two out of three drum level signals for reliable drum level low condition for boiler trip,we mount two transmitters on one side and the third one on the other side. Why the bias signal of -50% is included in the above equation? is it to keep the level at 50% minimum for the tube protection? three element is cascade system ?